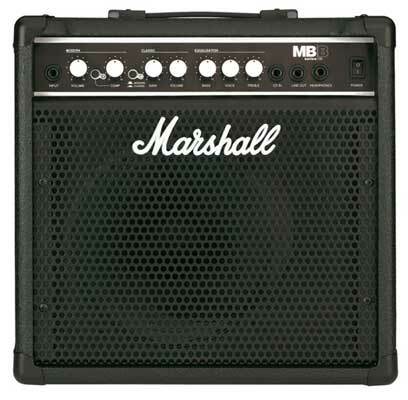 The big daddy of bass combo amps has to be the Marshall MB4410! It's big enough to sound monstrous, yet transportable enough to fit in the car. The 450 Watt bass combo houses 4x10 inch speakers, and an HF horn. 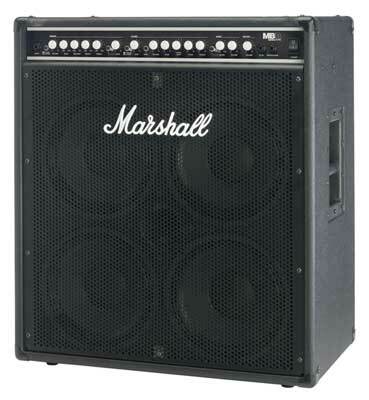 The Marshall MB 4410 bass combo booms with low frequency bottom-end. It features 2 channels, Modern and Classic, with a separate EQ for each channel. 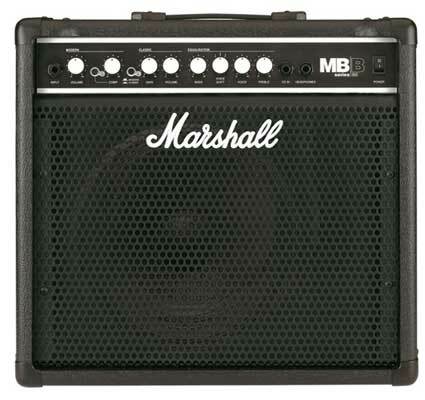 Modern features include bass, treble, parametric mid and switchable compressor with variable level control. The Classic channel with its ECC83 pre-amp valve includes a Boost switch and has a 3-band passive tone network. You can mix the MB4410 amp's 2 channels either from the front panel or from the supplied 2-way footswitch. The overall volume of the blend is adjustable in addition to the balance between the 2 channels.